Matchpoints Seminar 2013 opened with Robert Putnam as new Distinguised Visiting Professor at Aarhus University. The renowned scholar will lecture at Jytlands’ academic institution for one year. 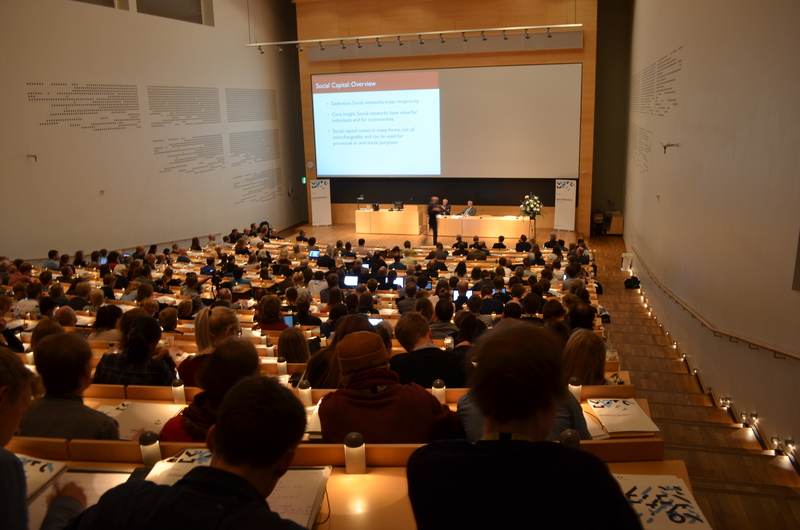 ‘Coming to grips’ with the relevance of culture for politics: From May 23rd to May 25th, Aarhus University hosted its fifth ‘Matchpoints Seminar’ for Social Sciences. With scholars from renowned international institutions this year’s edition covered “The Culture of Politics, Economics and International Relations” in lectures and panel debates with academics and professionals. Next to the variety of lecturers and workshops, the conference invites each year highly recognized social scientists to join the University for two years as a Distinguished Visiting Professor. This year the Harvard-based political scientist Robert Putnam, who’s work inspired the topic of this years edition, was appointed to visit the Aarhus University as a teacher for one year. He opened the conference on the first day with a lecture on immigration and Social capital. His most famous book, “Bowling Alone: The Collapse and Revival of American Community (2000)”, was frequently cited by other lecturers during the conference, redirecting to the immigration debate from his key note speech. “I think Europe is not tackling immigration the right way”, he told In-Sight Out Magazine Thursday evening. “A new sense of ‘us’ need to be created, instead of forcing immigrants to ‘be like us’. That is a huge challenge for Europe”. Another highlight of Friday’s event was Aarhus University professor Georg Sørensen’s presentation on the “Cultural Challenges to the New World Order”. He is professor of International Politics and Economics at the Aarhus University’s Department of Political Science. Mr. Sørensen also challenged Putnam’s central arguments. “The decline of social capital in the US was talked a lot about, but social inequality has not been addressed”, he warned. On a different topic, he also noted that countries as China had developed economically whilst not becoming democracies. “This suggests that two good things, liberal democracy and economic development, might not always go together”. Farreed Zakaria, CNN host, Time Magazine editor at large and Washington Post columnist, led the closing event of Matchpoint’s second day. At Aarhus Concert Hall, he talked about “The Culture and Politics of New Economies: Our Concern?”. Referring back to his Indian roots, his lecture accounted for an assessment about “the rise of the rest”, as he called it, citing also the BRICs in his talk. “The Chinese dream is basically the American dream, and you see that all huge new buildings in the country are designed by Western architects – in spite of having a very Chinese-like tip. This historically points back to Mao’s abrupt rupture with the past during the cultural revolution” he argued. “That is different in India, where you do not see such a trend: Indians want to do everything their own way, and I believe this is strongly related with the fact that India was a British colony and wants to move away from this past”. Throughout his speech he mentioned China and India several times and mentioned Russia frequently as well – Brazil, however, was cited only on a side note. “Brazil has lost its opportunity to rise” he told In-Sight Out Magazine in an exclusive interview after the talk. “The country was lucky to have China as its main buyer of commodities, but did not promote the reforms it badly needed”. After Zakaria’s talk a panel debate followed with Georg Sørensen (Professor of Aarhus University), Anne Knudsen (Editor-in-Chief of Danish Weekendavisen), Flemming Rose (Foreign Editor of the Jyllands-Posten) and Uffe Ellemann-Jensen (former Foreign Minister of Denmark), moderated by journalist Poul Erik Skammelsen, of TV2 News. BRICs, the rise of China, Syria, liberal democratic values and even Confucionism were some of the themes debated. At the Gala dinner that followed, Robert Putnam asked the participants to raise their glasses for the organizer of the event, Michael Bøss, associate professor of the Department of Aesthetics and Communication. “Throughout my professional career I have never seen an academic with the organizational skills Mr. Bøss showed in organizing this edition Matchpoints’”, he said. Since 2007 the Matchpoints Seminar are organized by the historian, who was already working on next years edition, as he told In-Sight Out Magazine.